Students across Mason County went back to school Wednesday following summer break. At New Haven Elementary, the children were treated to a “Hollywood Welcome.” They walked the red carpet, and were given “swag bags” by Principal Walter Raynes and Assistant Principal Tom Nunnery. The girls also received flowers. NEW HAVEN — It was the return of students to classes in Mason County on Wednesday, following summer break, with several schools holding special events. 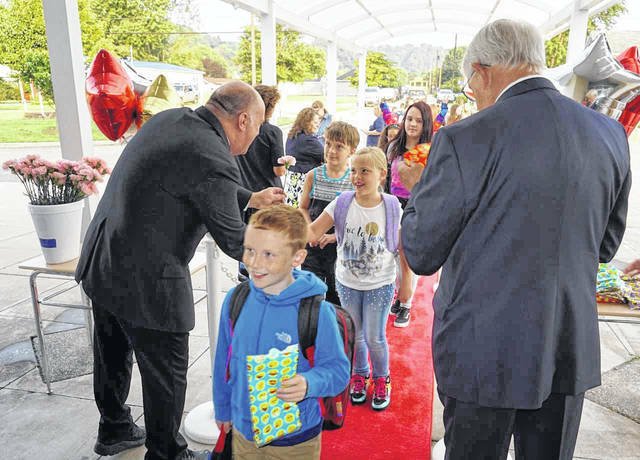 Children at New Haven Elementary (NHES) walked the red carpet into the school for a “Hollywood Welcome.” Students were greeted by Principal Walter Raynes and Assistant Principal Tom Nunnery, who were decked out in their finest suits and ties. Star-shaped helium balloons flanked the red carpet to show each child he or she was worthy of the special treatment. The students were presented “swag bags” filled with goodies, while the girls were given flowers for their 2018-19 NHES premiere. Awaiting them inside were members of the Tiger Men’s group, who directed the students to their classes. Across the county, first through twelfth graders began school. Kindergarten and pre-school students will begin at different times, however. Those students will receive home visits by their teachers, who will inform the parents of the start dates. This year’s school calendar includes three breaks, including at Thanksgiving and Christmas, as well as a spring break. Thanksgiving will find students off from Nov. 19 through 23. Christmas break will be Dec. 24 through 31, and spring break will be April 1 through 5. Other days observed with no classes will be Labor Day on Sept. 3, election day on Nov. 6, Veterans Day on Nov. 12, New Year’s Day on Jan. 1, Martin Luther King, Jr. Day on Jan. 21, and Memorial Day on May 27. There are 10 professional learning days for teachers, when students will have three hour early dismissals. They are Aug. 31, Sept. 14 and 28, Nov. 2 and 16, Dec. 21, Jan. 25, Feb. 18, March 15, and April 18. Students will be out of school for curriculum development days on Oct. 17, Jan. 2 and 18, as well as for an out of calendar day on April 19. Graduation ceremonies are set for May 24 at Wahama High School, and May 25 at both Hannan and Point Pleasant high schools. The last day for students is May 29.
https://www.mydailyregister.com/wp-content/uploads/sites/24/2018/08/web1_8.16-School.jpgStudents across Mason County went back to school Wednesday following summer break. At New Haven Elementary, the children were treated to a “Hollywood Welcome.” They walked the red carpet, and were given “swag bags” by Principal Walter Raynes and Assistant Principal Tom Nunnery. The girls also received flowers.